Calling all Kansas City homeowners! Do you know that you can transform your bathroom from a functional necessity to an oasis under your very own roof! It all starts with great flooring. We’re here to share with you the best and worst bathroom flooring options out there so you can make the most educated bathroom flooring decision possible. You probably already know this, but vinyl flooring and tile flooring are the best choices for bathrooms in general. Vinyl’s durability and versatility can’t be beat. It’s especially ideal for homes with children because it comes in styles that are soft and textured. In addition, tile is also one of the best flooring options for your Kansas City home. Whether you choose porcelain, ceramic or natural stone, these waterproof tiles come in a variety of colors and shapes. We are all about what hardwood flooring can do for your home, but we advise against it in your bathroom. Wood and water on a daily basis just don’t mix well. And you probably don’t want to risk that one big leak that could cause some irreparable damage to your floors (and wallet). This goes for carpet flooring, too. Just the sheer amount of moisture invites mold and mildew. If cushion underfoot is what you’re after, perhaps a few strategically placed throw rugs on your tile or vinyl flooring could do the trick! You can now achieve the look and feel and warmth of real hardwood with faux wood tile! Faux never felt so good underfoot after a hot bath or shower! And the same goes for luxury waterproof vinyl. It’s resistant to scratches and dents, and also waterproof while giving the appearance of hardwood, natural stone or tile. You can choose the right finish according to your style and budget for your Kansas City home bathroom. 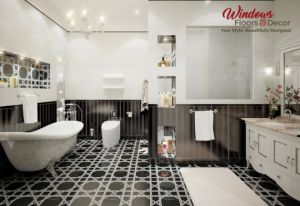 If you need help making up your mind and visualizing your perfect bathroom floor, then consult the experts at Windows, Floors & Decor and Carpet Direct KC. We’ll help you find the best possible bathroom flooring with free, in-home consultations. Previous Post Spotlight – Metropolitan Ensemble Theatre: "It's a Wonderful Life"